January 2018 - As you probably know, for every order, Made by the Forge pledges to plant a tree to give back to nature what we’re taking from it. 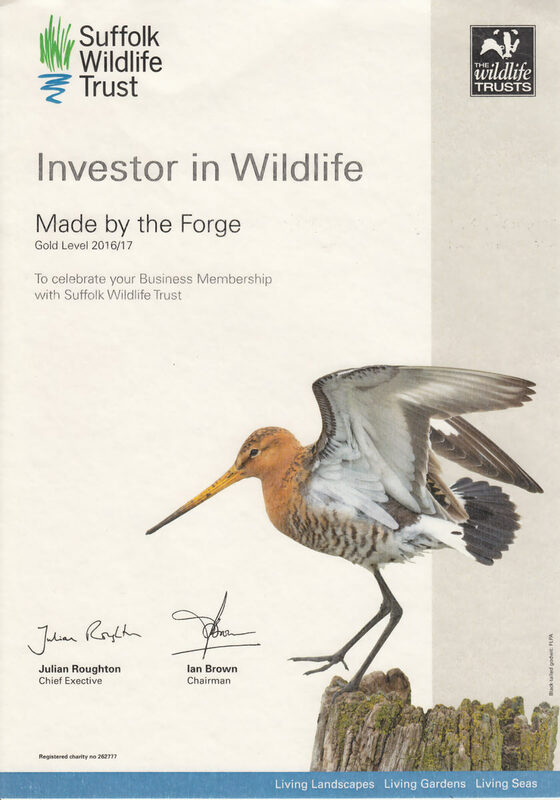 We assign this important part of our business to the Suffolk Wildlife Trust. 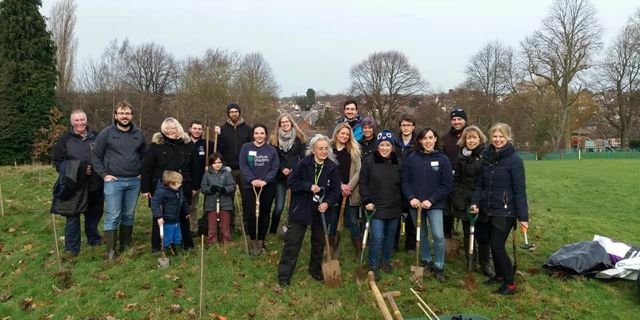 Rather than plant one tree at a time, we let the Trust choose the best location and then on a certain day, volunteers who care about the environment come along and plant hundreds of trees at once. While at Thorington in Suffolk, I was struck by the generosity of the volunteers. 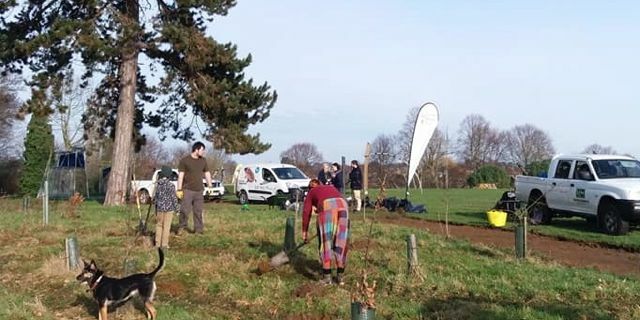 It’s such a good feeling to know there are dedicated and committed people out there who will give their time on a chilly December morning to plant trees given that the simple reward for their actions – a line of proud trees – will be years in the future. We’ve credited the volunteers at the end of this short 2 minute film to mark the occasion. (Click on the picture right to watch) I hope you enjoy it. April 2017 - Made by the Forge’s policy is to plant a tree with every order received. We do this in partnership with the Suffolk Wildlife Trust and it’s done cheerfully with the assurance that while our products may take something from the natural world, we are also giving back too. 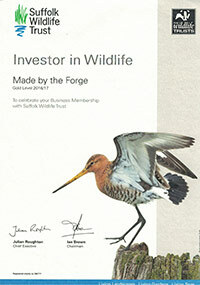 It is a certificate confirming that Made by the Forge is an ‘Investor in Wildlife’ and with a Gold Level status no less. 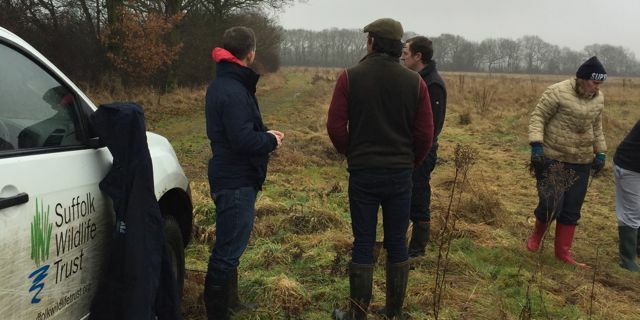 February 2017 - Richard and I met with Michael Strand, the Suffolk Wildlife Trust’s Development Officer in Leavenheath. We drove down a long stony track and through a gate, which opened up into a huge expanse of wild countryside. It was raining, as it duly does when we go to see the trees being planted by the SWT! We pledged a long time ago now to plant a tree for every order received. We still do this and attend the tree planting personally. 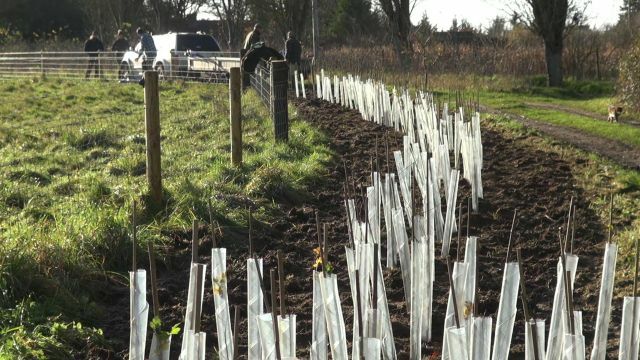 It takes place once a year with the Suffolk Wildlife Trust and this year a new green lane is being planted. The rain was steadily falling as the wind billowed around the volunteers who seemed in good spirits regardless of the weather. The men and woman were on a Team Building day away from their desks and warm office. This was the Customer Service Team from UK Power Networks. 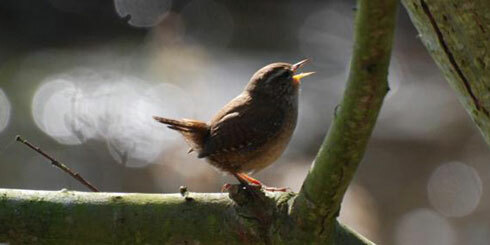 The volunteers are allocated two days a year to work with the Suffolk Wildlife Trust. 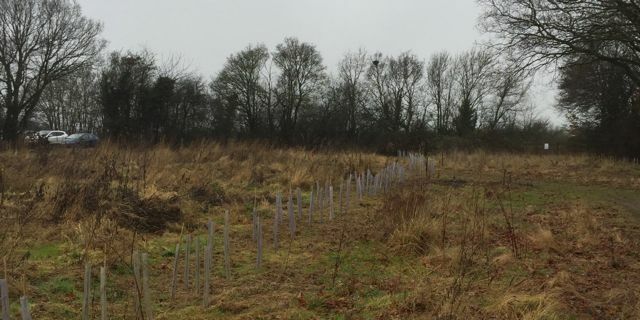 The planting was at Kingsland Copse, part of Ager Fen and Spouces Vale and was planned so that the new hedgerows would one day connect to the existing hedges of trees providing habitat for all sorts of species, especially the dormice which in recent years have dwindled in number. We were told that the dormouse is doing very well in this area due to their re-population of the habitat provided for them. They eat a mixture of flowers, nectar, hawthorn, autumn berries, blackberries and haws. 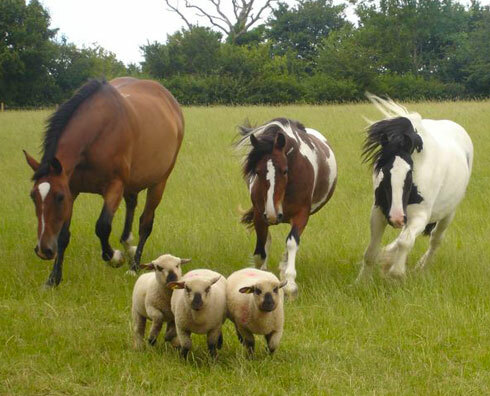 Creating this new green lane would provide more of a playground home for them. 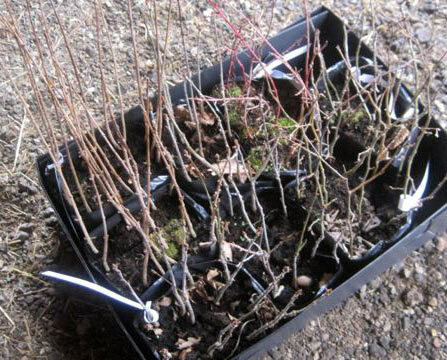 The rough mix of trees planted was approximately 50% hazel, 25% blackthorn and a selection of buckthorn, dog rose and oak which, we were told, are good for bats because they grow bigger than the other tree species. It’s all good news and Michael told us that the whole area that the Suffolk Wildlife Trust now own and manage around Ager Fen is now home to the nightingale again. It was absent for around ten years but is now back so this in itself shows the area is becoming rich in resources in which the wild world needs to flourish. April 2016 - The weather was terrible, but driving rain doesn’t stop volunteers from the Suffolk Wildlife Trust. 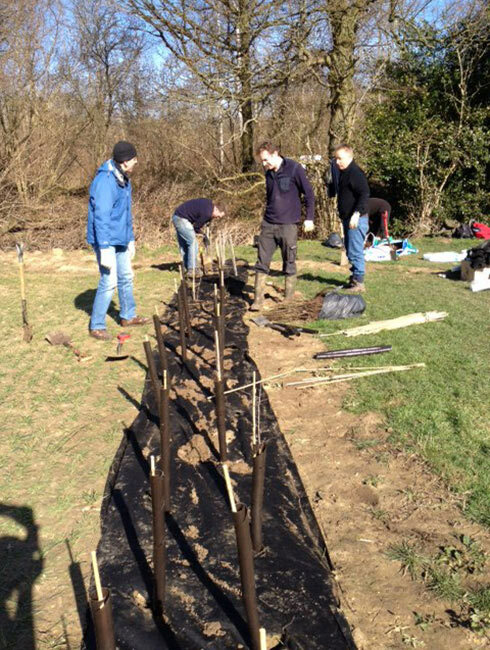 They were planting trees donated by Made by the Forge; we’ve done this to help offset CO2 emissions. We were at Levington Lagoon Nature Reserve, and learned that the new belt of trees will soften the edge between grassland and woodland and increase the diversity of habitats. 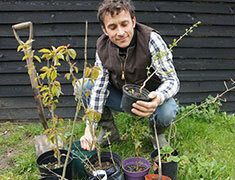 With luck the new trees will attract whitethroat, blackcap and other warblers. 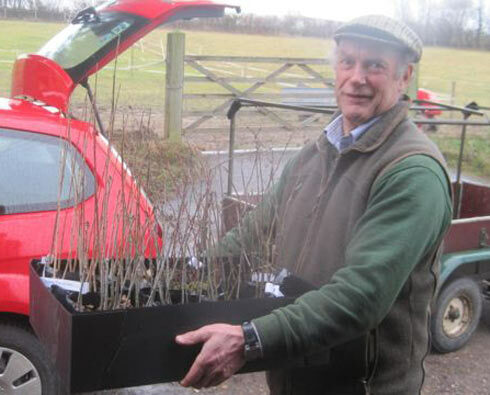 February 2016 - Tree planting funds have again been donated to the Suffolk Wildlife Trust. 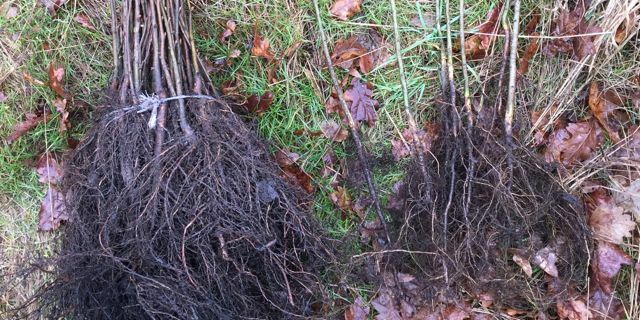 They use the money to buy trees and we are sponsoring, this Spring, two conservation projects: tree planting at Bradfield Woods and tree planting at Levington Lagoon. 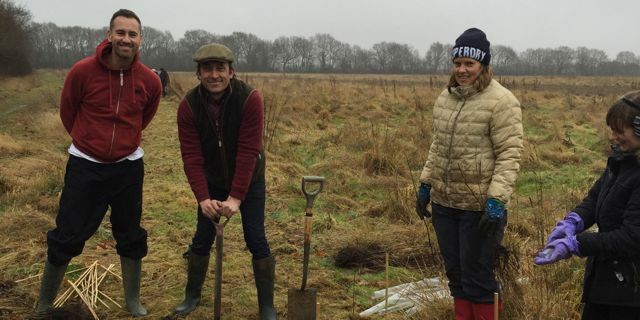 Michael Strand the Trusts Development Manager shares below the latest information about what is happening at Bradfield Woods and why their tree planting is so important for the Dormice. The trees planted by our Junior Rangers on the southern side of Bradfield Woods National Nature Reserve are to link this stronghold for Dormice with the outlying ancient copse named Glebe Wood. 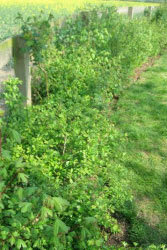 The 300 metre stretch of hedgerow which has now been fenced to reduce browsing pressure from deer is hoped to provide a corridor for Dormice to move across the surrounding arable fields. On the seven point scale of success for any reintroduced species, the final seventh point is to determine successful recolonization away from the original reintroduced area. This has happened at Bradfield Woods along the more westerly edges already and it is hoped the hedgerow planting linking Glebe Wood will replicate this success. Simon Barnes says: “It’s all about connections. A good deal of the Trust’s work involves corridors: joining up good bits of habitat so that the wildlife can commute from one to the other. It’s a principle operated by conservation organisations across the world. The Trust has established corridors between woods that are now used by dormice.” Suffolk Wildlife Trust magazine, January 2016. Made by the Forge is proud that it is planting trees and proud that its hand-made, wrought iron products are Blacksmith made in Suffolk. We make every effort to offset our CO2 emissions; and make sure that what the company takes from the Suffolk environment, it puts back into the Suffolk environment. Richard has a passion for the countryside and all the fine things that go with it. Planting trees, growing vegetables and fruit, preserving, cooking and eating it. His love of the environment has led him to pledge planting trees to offset CO2. Planting takes place once a year in the Spring based on the number of orders in the previous year. Follow our blog for updates or scroll down to read the history. Self-sufficiency is the driving force behind the business. He believes in having a quality product that will last a life time and that good living should not cost the earth. September 2015 - In the Spring of 2015 Made by the Forge donated money again, from each product sold, to the Suffolk Wildlife Trust. 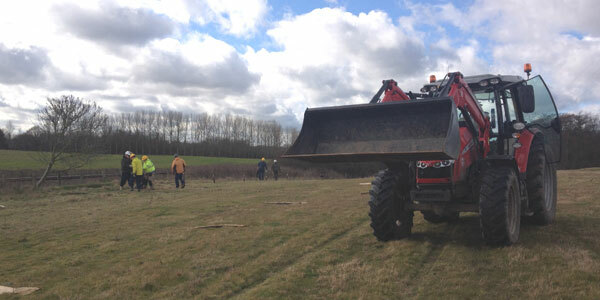 This helped to buy trees to plant on newly acquired land at Ager Fen. SWT purpose is to help regenerate this land, which has been extensively farmed, and let nature return and thrive. The trees were planted by volunteers so all the money we gave the Trust was spent on trees which is what our tree planting pledge is all about. Below is a recent update from Will Cranstoun the West Suffolk Sites Manager. "The trees at Grove Farm have established themselves well in somewhat hot and dry conditions. We (the reserve staff) have been going over frequently to water them making sure their roots get off to the best start. We also placed bark chippings around their base to retain moisture and stop the ground drying out. 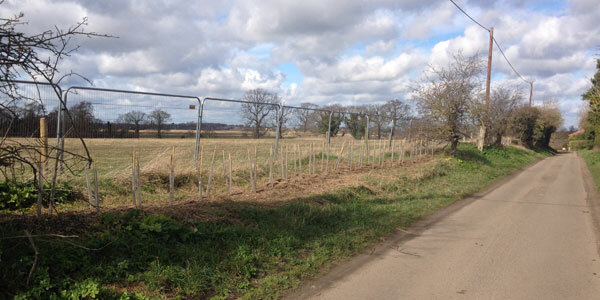 As you may be aware we have also substantially protected the trees from deer browsing by means of wooden tree guards. I’m sure they will go for from strength to strength, moreover with all the recent rain and dare I say it a mild winter I have heard being forecast. " 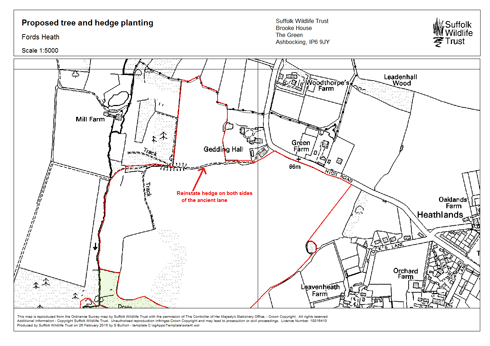 March 2015 - We are delighted to be donating to the Suffolk Wildlife trust again to enable tree planting to reinstate part of an ancient green lane on the Arger & Spouse’s Vale land. Our donation will be spent on purchase of the trees, stakes and guards needed to link up an important part of our natural and cultural heritage. The map below shows the area to be planted and to the west the ancient hedge abounds with thick hazel coppice and mature oaks, and bluebells adorn the ground come April. The future seed source from this hedge will enable a mixed landscape to develop around it to reflect the furzy heathland from the past. 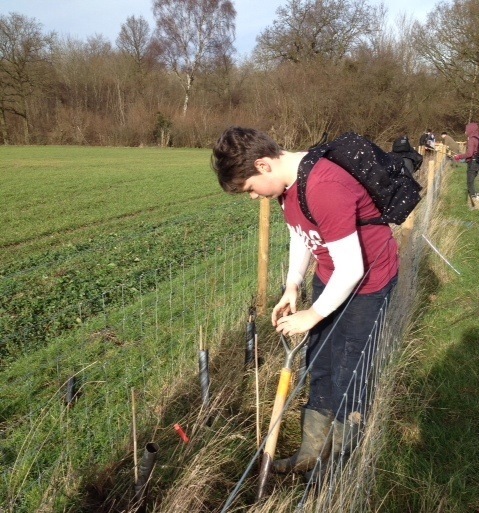 Volunteers with Suffolk Wildlife Trust planting in Spring 2014 to link up Bradfield Woods with surrounding areas. 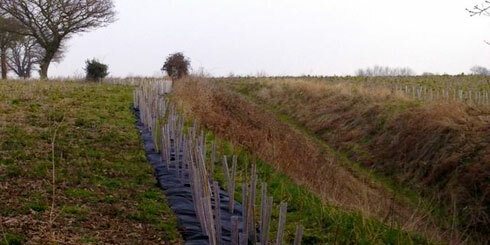 Supporting Suffolk Wildlife Trust in 2013 our donation helped to plant 1000m of hedgerow to re-establish critical habitat connections for the native dormouse. 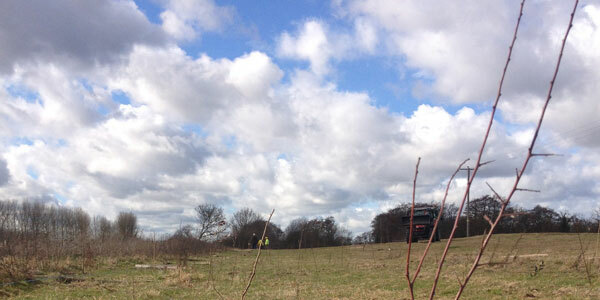 The hedgerow is planted between Bentley Long Wood and Brockley Wood. 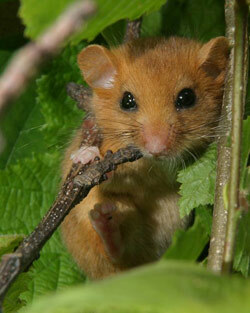 We are thrilled to be supporting the Suffolk Wildlife Trust in their plight to save and protect the Dormouse. Made by the Forge’s tree quota for 2012 is helping to plant 1000m of hedgerow to re-establish critical habitat for this tiny weeny mouse. 06 December 2012 - Hedgerow trees progressing well. We are delighted to say that the majority of the hundreds of trees we planted early on this year 2012 are looking very healthy and strong. We pledge that every product sold has one tree planted to offset CO2 and to give a little back to our wonderful environment. 5 April 2011 - Trees in and looking good. The rain has given our new trees lots of life to climb their plastic tubes into the world. They seem to be growing fast. They are really looking healthy and good. Mr Castleden with the saplings. 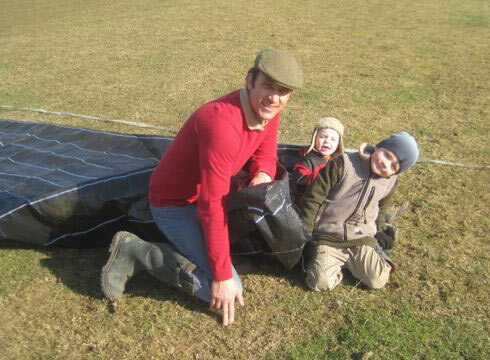 Richard with keen helpers James and Sam. It always seems that any sort of preparation before a task takes so long. The early heat wave on Sunday made for a perfect day preparing the ground for our young trees. 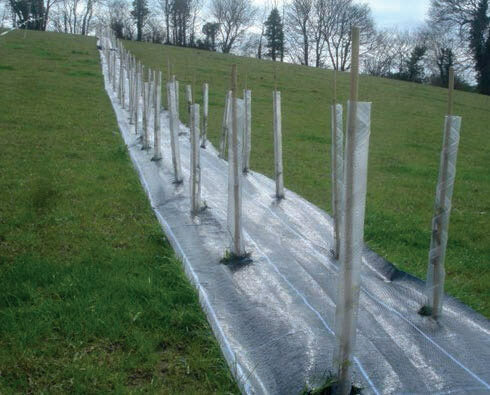 We took Mr Castleden’s advice and put down a membrane so that the little trees don’t have to compete with the weeds for moisture. The actual line took a lot longer to get perfectly straight than expected. Planting will resume for our pledge at the weekend. 10th April 2010 - The trees I pledge to plant every year have finally turned up. 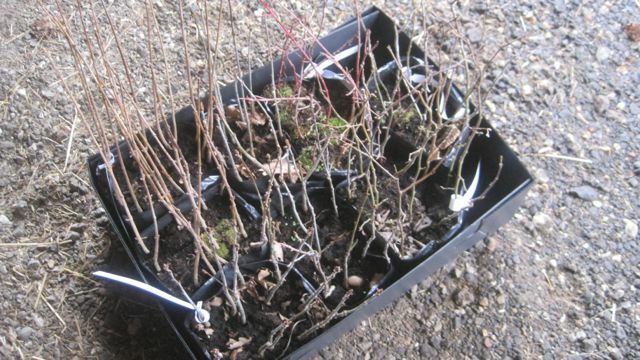 They went astray somewhere but are now here in Suffolk and are in the process of being planted. This year I have approximately 150 of varying species. 2009 - I have pledged to plant a tree for each pan rack that I sell so that I can offset some of the carbon that is produced in the forging process.